Marrakech city nightlife is legit one of my absolute favorite things about Marrakech. While I can get down with hanging out in Djemma El Fna at night from time to time with friends to eat in one of the food stalls or listen to the Gnawa musicians or watch some of the traditional games being played, sometimes I just want to get dressed up and check out a restaurant, bar, or a good ol’ nightclub. Kozy Bar is on the other side of the Mellah Plaza. It has a great rooftop patio that gives you a fantastic view of the Medina at sunset. It’s a bit pricier than other locations in the area but it’s still a great location for dinner and a bottle of wine. A few doors down from Kozy Bar you can check out La Tanjia. Beautiful décor and a great rooftop patio another location you enjoy dinner and fantastic views. This place is pretty fun with its artsy, laid back vibes and its well-priced drinks and tapas to the modern art you can purchase off the walls, it’s becoming a fast staple in the nightlife scene. Moving on I saved the most expensive hotel clubs and a casino for last. The very posh neighborhood of Hivernage features some of the most glamourous and elegant hotels in the city. These two I’m going to put together as they are both in the same building next to Theatro which are all part of the Es Sadi Hotel grounds. If you like slots machines and gambling then you can check out the Casino and test your luck. If you prefer to skip the gambling, you can walk straight to the back and find this restaurant-by-day-nightclub-by-night. They have about two in-house DJs and a live band that covers old and new hits in their own style. 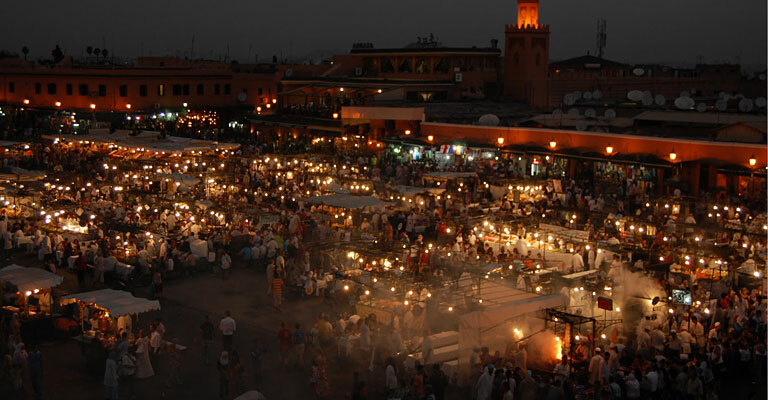 Hope you jotted some of these down as your “Marrakech city nightlife” must-see list! And if you’re really trying to make this a reality you better sign up for one of our final spots on our Morocco Beauty Journey in May 2019. We will be diving deep into understanding Morocco and its complex culture through the lens of beauty & native rituals from May 7th, 2019 – May 16th 2019. We are seriously about to sell out BOTH tours, give yourself the trip of a lifetime to look forward to and sign up! Also, if you haven’t checked out our other #MoroccoBeautyExploring posts check out our Morocco beauty journey’s Intro to Moroccan Arabic: Helpful Darija Tips.